The Woodland Cedar Box Beam comes in modern and smooth routed finishes, as well as hand hewn styles, including the coveted reclaimed style. Due to the kiln dried 1″ stock used in fabrication, these beams hold their appearance far, far longer than conventional beams. Since there is far less moisture transferring from the wood, it is able to retain its original finish for decades. Unlike faux beams, our exposed ceiling beams are made from real wood. Our process uses old world carpentry and masterful hand craftsmanship to produce a beam that is superior to any other cedar beam in existence. 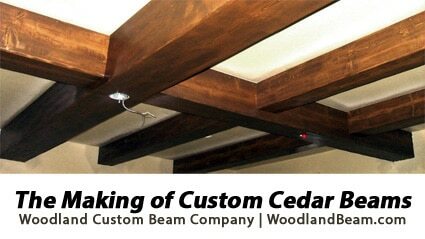 Our beams are completely undetectable as anything other than a real cedar wood beam. Its not a faux beam, it is a Woodland Beam!